We spent this past weekend in Lynden doing some prep work on the Van Dyk Rd so Bjorn and Jenny can move into Esther's parents former house. It involved getting rid of the last of the furniture and repairing a vinyl floor. At the same time, we got to see my sister, Ellen who went to China this summer to teach English. She had a great time and wants to go back. 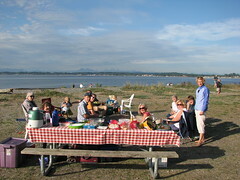 The Bulthuis family (my mom, siblings and spouses as well as nephew Aaron and family) had a picnic at Birch Bay. It was a nice evening at the state park and we enjoyed views of the bay and Canadian mountains and an evening campfire. We also got to spend some time with Esther's family. Bjorn and Jenny came back from Mexico and Esther and I went back to school today. Another summer is over!